You think it’s unlikely to drive organic traffic to your website without ranking on the first page of Google? Well, we are here to tell you the opposite. You CAN get lots of organic traffic not having super high rankings in Google. How? Let’s learn the 3 main ways now! As a proven fact, longer and more quality content performs very well. And, with this type of content, you don’t need search engines to rank you on the first page of Google to generate lots of traffic. Want to know why? Think about it! if you share quality content that offers real value to your target audience, not just strategically chosen staffed keywords that work with search engines, your readers will be more likely to share it. It is really that simple. They like your content and they clearly receive the value it offers – they share it with others. Human psychology! Now, in order to drive organic traffic to your site without superb rankings in SERPs, you will also need to publish long content. That’s right! Longer content has more incentive to provide more and really valuable information to your readers than short, abruptly written content. Which one would you be more likely to click on, let alone share it with your peers? We bet it is the second one, because when one is searching for some information, that one is more likely to enjoy more detailed and comprehensive content on the subject matter than short not all-inclusive content. Now, here is the thing. If you want to get ahead of your competition, you gotta learn what they are doing and see what you can do better. No copying! In terms of learning how to drive organic traffic, do your research on how your competition is getting its traffic. Do they have a large social media followers base? Are they constantly doing guest blogging, positioning themselves as industry experts? Do they use paid ads? You get the point! As you gather the required information, you will then be able to understand where to focus your own efforts to get the most organic traffic you have been seeking for. And, as we have already said, it is no copying. Learning about your competition isn’t considered copying. It is considered learning and acting strategically upon that knowledge. Sounds right, doesn’t it? Are you really willing to drive organic traffic to your site without high rankings in search results pages (SERPs)? You really do? Then, what are you waiting for? Be proactive! How specifically? There are 2 main ways! Firstly, go ahead and find guest blogging opportunities. Find websites where your content can be of great value to their audiences, and share it with them. Simple! It can give you the juicy opportunity to get lots of traffic to your website with only a single link in that content directing to your website. Secondly, share your content in other sites where interested audiences may visit. Such sites can be resource pages, community based sites, groups in social media etc. Just make sure you are sharing it in relevant places, where those who are likely to see it are within your target audience. Otherwise, it is just a waste of time! See? High rankings in Google are not the only way to get traffic. 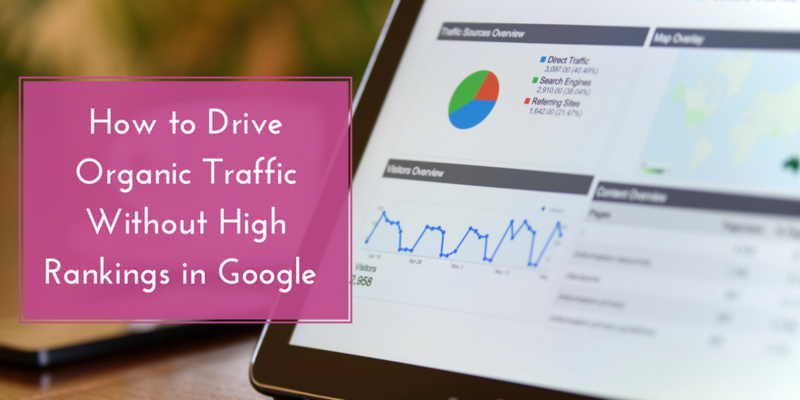 If you really want to drive organic traffic to your website, you better try these 3 proven ways. They work like magic!